We have Single and Twin Bedroom. One of the twins Disabled friendly. 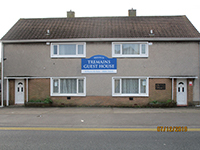 Colour flat-screen freeview television, dvd player and tea/coffee making facilities as well as Wi-Fi internet. Car parking of 15 cars. Guest lounge and dining rooms. Recycling system and a green policy. 5 minutes walk from Bridgend town centre. 20 minutes to Cardiff or Swansea. 10 minutes from the coast and mountains. 20 minutes from Afan Argoed Mountain Bike Centre.